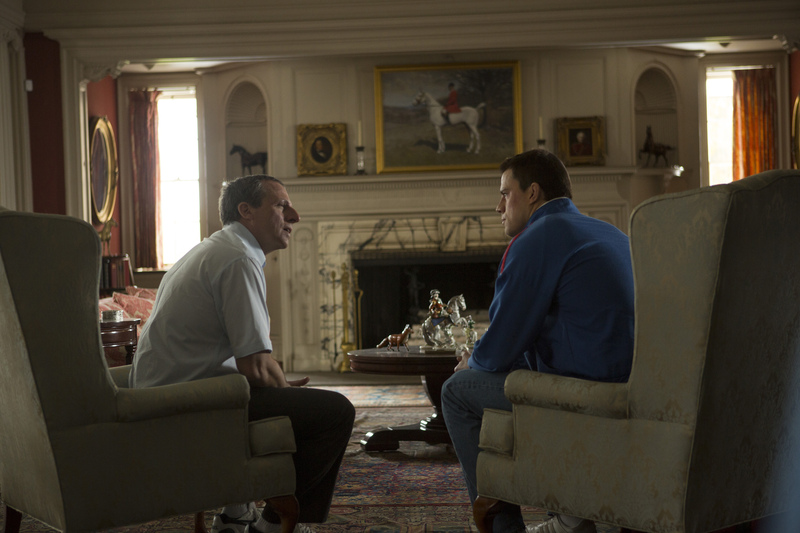 Read two critical perspectives on Foxcatcher (Bennett Miller, 2014), by Marc Huestis and Dennis Harvey. 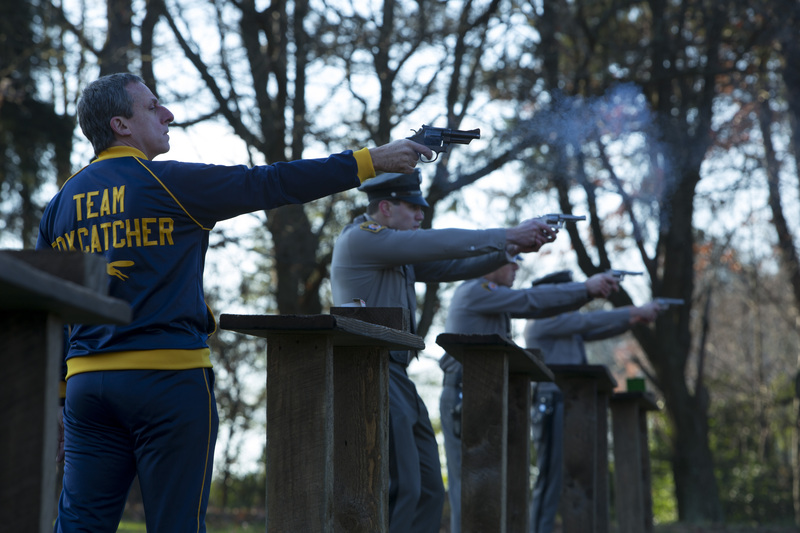 Foxcatcher opens in San Francisco on Friday, November 21 and throughout the Bay Area on Friday, November 28. Foxcatcher , Bennett Miller’s sad, brave new film delving into the world of wrestling, is a perfect film for the holidays—that is, if you like depressing movies. Set primarily in autumn and winter, its patina is dark and somber, with a muted tone to match. It’s the story of John du Pont (Steve Carrell) a friendless scion of the du Pont chemical legacy, and his attempt to make his life relevant by sponsoring two Olympic champions—the Shultz brothers. He first takes on Mark (Channing Tatum) who is living in solitude and in the shadow of his older, more popular brother David (Mark Ruffalo). Mark is trapped in his own slovenly claustrophobia, and exists on ramen noodles, memories of a gold medal, and inner turmoil. When he gets a phantom call from du Pont’s assistant luring him to a meeting with the multimillionaire, it seems like a small salvation. He is swooped up by a private helicopter to first quietly survey the sprawling grounds from high above. Upon landing, Mark sees a world he could only have imagined in his wildest dreams. The du Pont estate is huge, supported by classic American pillars, with the stars and stripes whipping proudly through the wind. Yet in its long empty halls, we get the sense John du Pont is trapped by his wealth—living like Charles Foster Kane in Xanadu. He’s alone, and a perfect match for Mark. DuPont offers Mark $25,000, the largest figure the young wrestler can come up with off the top of his head, and sets him up in “the chalet,” a guest house beyond any of Mark’s imaginings. But Mark is never left to himself, instead constantly subjected to late-night impulsive visitations by his prowling benefactor. There is a dark, creepy tone of desire, seduction and envy in their early relationship, and when it runs its course, du Pont reels in his revered brother Dave to the training facility of Foxcatcher Farm. There, they train a team for the 1988 Seoul Olympics. What follows is a chilling tale of the power of money, the perversity of class, and recklessness of wealth; each character used as a pawn in some tragic game of chess. 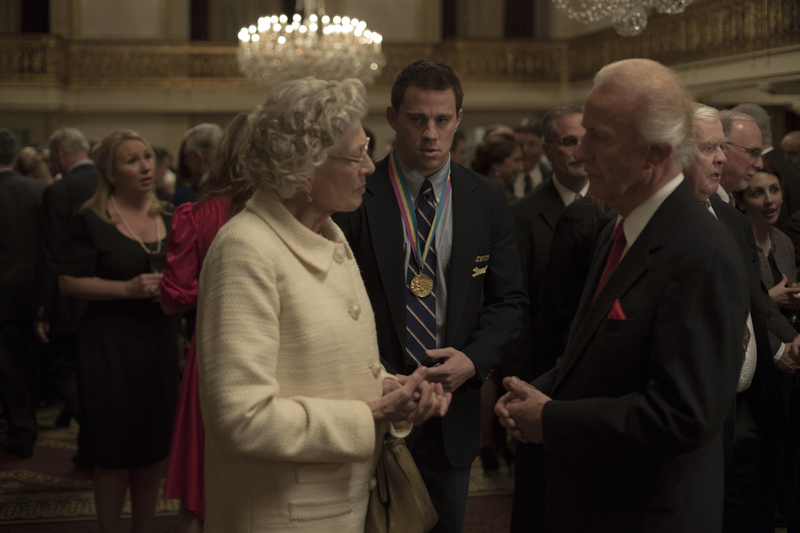 Du Pont is constantly attempting to please his unimpressed mother (Vanessa Redgrave), a condescending matriarch who calls wrestling a “low” sport. Like a queen on the chessboard, she dominates. Beaten down by his mother, du Pont lashes back, and through his controlling wealth, attempts to manipulate all the pawns around him. Ultimately his game of intrigue becomes a dance of death, and an impulsive act of murder takes the audience by surprise and hits them squarely in the gut. It’s a great work of ensemble, led by Carrell, who seems to have inherited Nicole Kidman’s nose from The Hours to accentuate the unease. Yet he acts well beyond his makeup: his uncomfortable body language, salacious smile, and whispered voice are right on the money. Sometimes it takes a comedian to plummet to the depths of despair—witness Mo’Nique in Precious , Peter Sellers in Being There , and Robin Williams in Good Will Hunting , to name a few. With this complex performance, Carrell joins their esteemed ranks. He is beautifully and athletically supported by Channing Tatum, whose physical prowess is matched by his inner anger, and Mark Ruffalo, bigger, butcher, and more sensitive than he’s ever been. Ruffalo’s David is the big brother all of us wish we had. Vanessa Redgrave milks every nanosecond of her four minutes of screen time, and giving a master class on the power of silence. The film is also a great leap forward for director Bennett Miller (Capote , Moneyball ) who seems to be drawn to stories of outsiders, bringing them to life in deliberate, careful cadence and color. And kudos to Miller for quietly yet boldly tackling the issue of class, something few American films address. 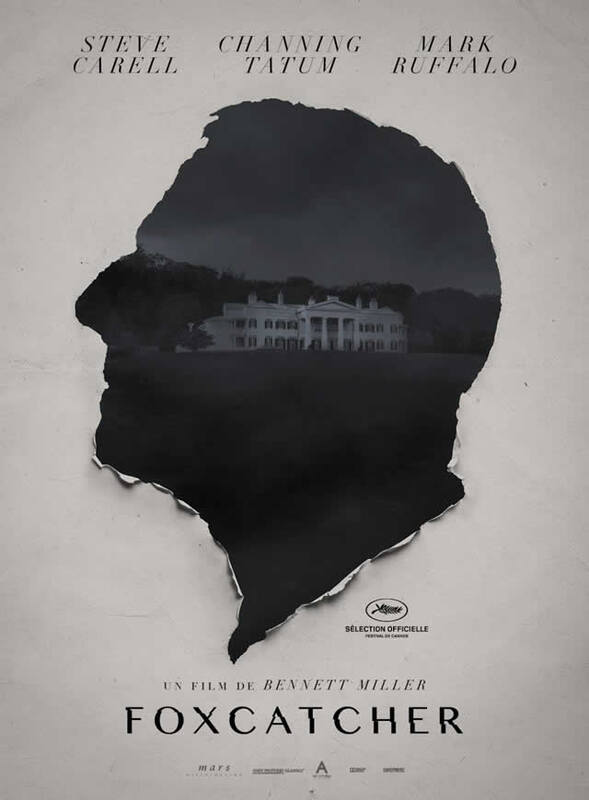 Foxcatcher is a multilayered work. It is ultimately a lonely film. Very, very lonely. Each character wrestles with their solitude, save David, which is perhaps why his tragic fate is sealed. And it uses wrestling as metaphor, leaving the audience with the lingering question of who is the hunter and who is the hunted. 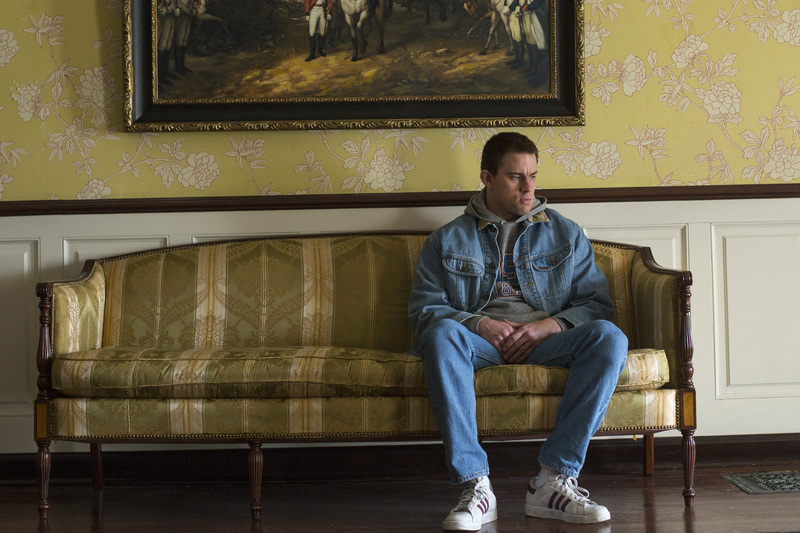 At Foxcatcher, every character plays out their preordained role in an almost Shakespearian somnolence. This unflinching depiction of the American dream gone awry and the perverse unraveling of the 1% leaves us both enthralled and gasping for air. One hopes it’s the one to catch come Oscar time. 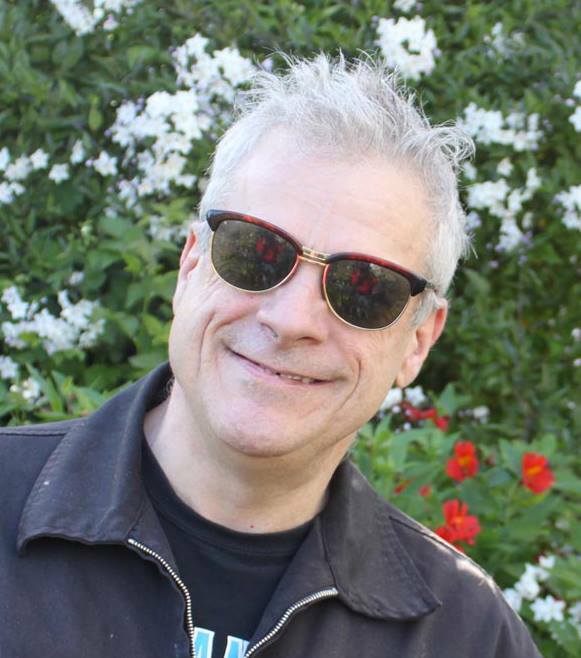 Marc Huestis is an award-winning filmmaker and impresario at San Francisco’s Castro Theatre. On December 19, he hosts An Evening with Bianca del Rio: Rolodex of Hate (Christmas Edition), a night of stand-up with the winner of the most recent season of RuPaul’s Drag Race. Next year he celebrates his 20th anniversary at the Castro, and he’s currently working on his memoir, Run, Ann-Margret, Run . Entertainment is, by definition, supposed to be enjoyable. But not all art, of course, need be pretty or pleasant. The new Foxcatcher is damn near excruciating—an often cringe-inducing experience that aims to replicate the sensation of being in the presence of someone completely off their nut, without being able to escape, complain or even acknowledge the problem. It succeeds all too well. You may or may not find this one of the best movies of the year, but you’ll almost certainly agree it’s one of the most discomfiting. In the 1980s chemical company heir John E. du Pont, an “eccentric” whose passions had hitherto been mostly limited to stamp collecting and birdwatching, developed a midlife fascination with the sporting life. This eventually extended to him becoming a “coach” and deep-pocketed benefactor for a team of Olympics-hopeful US wrestlers, including the already gold-medal-winning brothers Dave and Mark Schultz. He built training facilities on his New England familial estate, Foxcatcher Farm, with some athletes and staff living on the premises. All this went down in flames, however, when for reasons still unclear, du Pont shot Dave Schultz to death—not in the heat of the moment, even, but with inscrutable, cold-blooded deliberation. This latest film by Bennett Miller of Capote , Moneyball and the documentary The Cruise doesn’t explain that tragic act, which will always remain something of a mystery. (Found “guilty but mentally ill”—as opposed to not guilty by reason of insanity—du Pont died in prison four years ago, at age 72. He did not speak publicly about the crime during his long incarceration.) Instead, it simply captures the creeping unease of a bizarre situation, its protagonists variously protected and muzzled by money, privilege and intimidated gratitude. Out of the blue one day, Mark—and only Mark—is summoned for an audience with John E. du Pont, about whom he knows nothing. But he does know enough to be impressed by the older man’s obvious wealth and power, which seem to operate in a different universe entirely from his own furtive, scraping-along midwestern existence. He also realizes that he’s being offered a fantastic opportunity. The only flaw is that Dave, whom du Pont also wants on his “team,” doesn’t want to uproot his wife and children in order to join him. So for a while, Mark lives there alone, and then with other hand-picked wrestlers, primarily training for future competitions. But he’s also a sort of paid companion to a patron whose motivations, moods and actions can be bewildering, even alarming. (It was later suggested in court that du Pont had developed paranoid schizophrenia.) At some point Dave does sign onto “Team Foxcatcher,” only to find communication has already drastically deteriorated between Mark and du Pont, for reasons neither will acknowledge or articulate. About as far from a standard crowd-pleaser sports movie as you can get, Foxcatcher is instead a deliberately paced, stark drama suffused with humiliation and dread. The most emotionally brutal scenes are ones in which the weird, diminutive, not particularly fit du Pont strains for locker-room-style camaraderie with the burly young athletes who must awkwardly humor him, or lose their paychecks. Mental illness is like a sickroom haze here that the sufferer is disinclined to acknowledge, and his minders/employees too polite, intimidated or simply untrained to identify themselves. Comedian Carrell, almost unrecognizable with his greyed hair, lumpen carriage and nose prosthetic, sinks so deep into this figure’s impenetrable delusions that you will have no trouble being distracted by thoughts that this is the actor from The Office and The 40-Year-Old Virgin . And while one wishes there were more of her, Vanessa Redgrave makes an indelible impression from her few scenes and fewer lines as du Pont’s imperious yet well-intentioned mother. 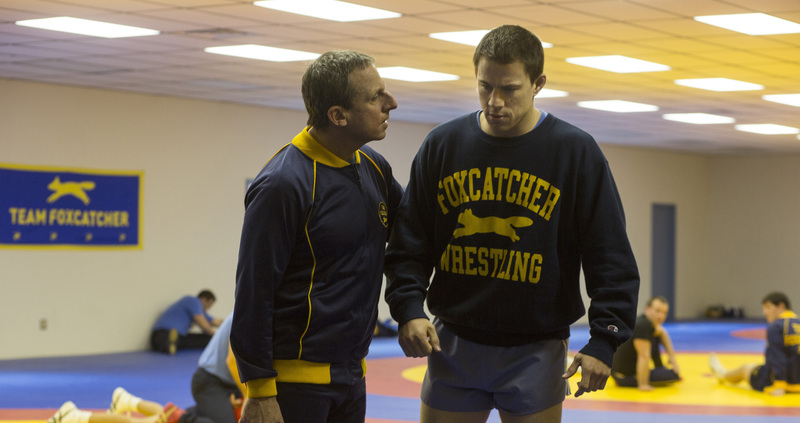 Those looking for cleaner insight into what happened and why may find Foxcatcher frustrating. So, too, those who expect more mat action and less slow, cryptic psychological suspense. (Capote and even the comparatively upbeat Moneyball were also very quiet, unhurried films by mainstream standards.) Even admirers may be a little bewildered, or at least surprised, that Miller so completely downplays the hint of closeted sexual predation—though the fleeting suggestion we do get is perhaps quite enough to raise the issue as a potential factor without risking an exploitative, homophobic taint. Indeed, Foxcatcher may be quite understandably disliked by people who simply go to the movies with an expectation of enjoying themselves. It is not, to say the least, a fun watch. But if you’re up for a powerfully downbeat tale that is at times skin-crawlingly uncomfortable, Foxcatcher could be as memorable a movie experience as you’ll have this year. Whether that constitutes a recommendation or a warning is your call. Dennis Harvey has been publishing film reviews since the era of the typewriter. He’s a member of the San Francisco Film Critics Circle and currently writes for Variety and Fandor. This entry was posted in Films and tagged Dennis Harvey, film review, Films, Foxcatcher, Mark Huestis. Bookmark the permalink.